Algoryx announces support for integration of AgX Dynamics with Unity3D. Unity3D is one of the leading platforms for development of computer games, serious gaming and professional simulators. AGX Dynamics enables a wide range of applications in Unity3D, for eg training simulators, virtual prototyping, robotics, vehicle and maritime simulation. This release addresses those that need to go much further in fidelity and performance than what is possible with animation oriented game physics, and also those that need a wider range of multi-physics, such as vehicle dynamics, hydrodynamics, hydraulics, wires and cables, and advanced contact mechanics. 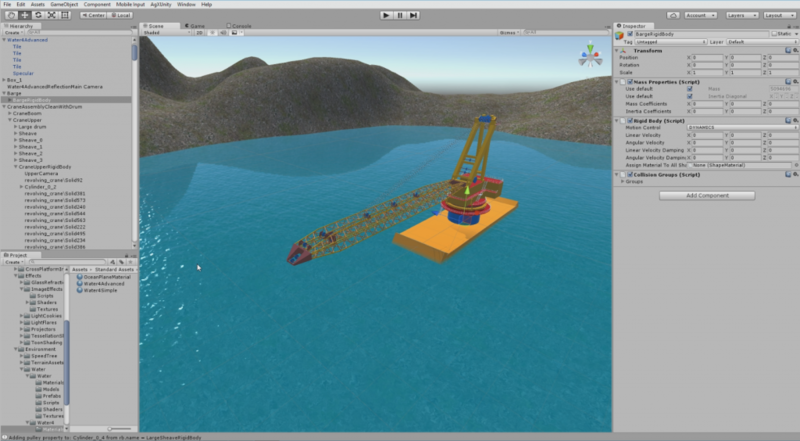 AgX Dynamics running integrated into Untity3D simulating an offshore crane with wires.